The events last night that led to my granddaughter Madeleine taking care of her first ever baby doll have once again inspired me to write about the connection between personal happiness and broken systems. 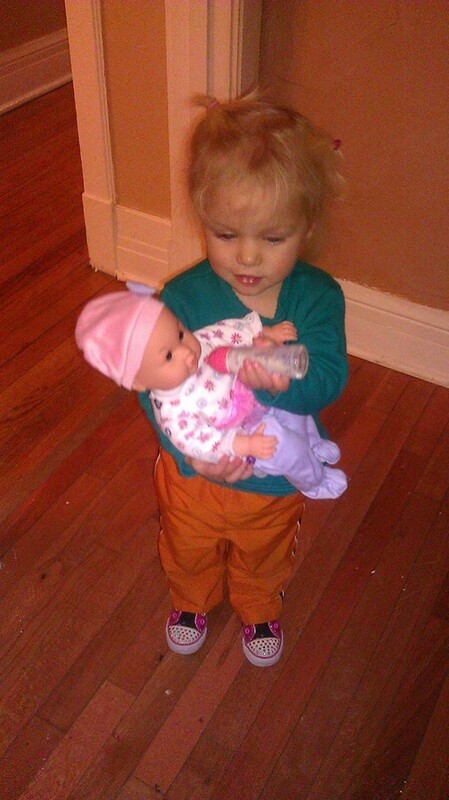 My granddaughter practices nurturing relationships with her first ever doll. My path is, of course, different from the Pope’s. I believe that cultivating personal happiness is a key element (not the only element) in working toward this shift. Here are a few reasons why. With greater understanding of personal happiness, comes a deeper appreciation of the sadness, emptiness, and destruction inherent in relying solely on Gross National Product measurements of success. When we internalize the knowledge that money and material goods are important but only a piece of our personal happiness, and also understand that chasing the almighty dollar can seriously undermine our enjoyment of life, we can so much more easily grasp the practical and visionary potential of a Gross National Happiness paradigm. Oh, yes, and we are also more fun to be around — which no doubt makes us better messengers. Okay, I’ll climb off the soapbox now and share what made me want to climb up there in the first place. About a week ago, my daughter Jennifer’s old clunker car finally died. She and my 20-month-old granddaughter will soon be joining us for a long Christmas break, but for a week and a half, she has had to cobble together a new transportation “system”: getting rides from friends, walking, and taking the bus. She is fortunate to live in a city with decent public transit, but even so, last night my daughter and granddaughter spent 45 minutes on a cold, dark, and snowy Wisconsin night waiting for the bus to take them home. It was pretty hard for Jennifer to be happy when her baby was crying from the cold. My daughter sang to the baby to keep her calm until Jennifer’s cheeks were just too cold to keep singing. Of course, the bus arrived eventually. At home, Jennifer decided it was a good time to open a Christmas present from Madeleine’s other grandmother. That present is Madeleine’s first baby doll. Watching her toddler practice taking care of this immediately beloved toy gave my daughter a lot of reasons to feel much happier — gratitude, love, savoring the moment, etc. So the story has a happy ending. To me, this little vignette illustrates both the limits of, and the value of, personal happiness within broken systems. For starters, cultivating our internal happiness is especially important in the context of broken systems because, hey, this is the only life we get! We should make the most of it, no matter the systems we live within. I am so glad Jennifer and Madeleine got to end their evening on such a positive note. To be clear, my daughter’s situation isn’t that bad. She has a great job, a wonderful apartment, and a cousin who is helping her get a new car over Christmas break. She’s only lived in Wisconsin a short time, yet she already has a group of friends who have been amazingly generous in providing rides. Jennifer’s monetary resources may be limited, but she has almost an embarrassment of riches in terms of friends and family who love her and can help when help is needed. Which brings me to another reason for cultivating personal happiness, a la nurturing relationships: it provides us the tools to build alternatives to systems that break. And then there’s the obvious: we should all be weaning ourselves off fossil fuels. A political and economic system focused on the well being of people and the planet would surely be moving rapidly toward excellent systems of mass transit. Another obvious point: transportation is just one of our many broken systems. That is why, this Christmas season, I will be spending lots and lots of time with my family and friends — giving and receiving, singing, playing in the snow, laughing, meditating, and doing my best to live a happy life. At the same time, I’ll be working with my friends at Gross National Happiness USA and The Happiness Initiative to move towards a world of greater peace and justice, a world that does more than pay lip service to well being for all. As Tiny Tim says, “God bless us, every one.” Everyone. And now I have to go bake cookies.